Batam Island is very near to Singapore. I have been living in the small island for about two years but never had a chance to visit our famous neighbor until last Saturday. Lucky to have the chance to join this brilliant group outing in Batam last week. Good deal, good friends, good holiday, good bonding, good teamwork and good games. 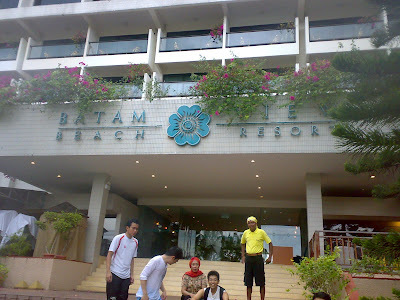 In simple English, last week's Batam trip was loads of fun and good time!!! What a celebrated (brief) holiday. Wish we had more days to have fun there!!! Holiday is never enough. Risyad, Jo, Ibu Ani Untung, Robby and Tony a.k.a. Mr. Black (Our games' facilitator). I still could not see the beauty or decipher the conveyed meaning). The smart and talkative parrot which successfully awed our hearts. A supposedly the best Seafood Restaurant with Karaoke facility in town. Dangdut was very dominant there! Tahu/Tempe, Lalapan, Cah Kangkung, Sop Buah!!! Yummy! This hotel's massage parlors amazingly can afford up to 65 people at once and we must book in advance to experience the massage here. Apparently, Batam is well-known for its massage services. Tons of tourists from Singapore and Korea deliberately visit Batam just for its massage experience. I was strongly advised that Batam's massage is a MUST TRY. Cheap and good. S$ 30 for 1.5 hours. As such, almost all of us decided to try it. The massage experience in Batam was indeed unforgettable. Even until this very day, I can still feel the fabulous effects. I found it rather painful instead of soothing. The scrub made it even painful. The supposedly relaxing massage made my body aching this whole day. My lower legs are killing me as if I just did a long marathon! Aww... The assigned masseuse was apparently too strong for my taste. Anyway, the bright side of all this is the dead and dulling cells' exfoliation. Hopefully my skin is softer and whiter by now! Unfortunately, yesterday we had to skip some of the tour itineraries due to the bad weather and limited time. So, we had to go back to the ferry harbor and head back to Singapore. It was indeed a tiring trip but all the fun we had was absolutely worth everything! Second round to Batam? Hmm, why not! Almost all products sold in Batam are specially priced for tourists. Everything is relatively expensive there.